During the 1960s, people began to be really displeased with the way many products were being made. At the same time, NASA began a major project. NASA wanted to create some sort of material that would protect astronauts during take-off. The professionals at NADA had no idea what they created. NASA developed memory foam in the 1970s. Although they were astonished at what they created, it proved to be useless to them. Memory foam had characteristics of both a solid and a liquid at the same time. When you placed your hand into the foam, the print stayed for a short time after your hand was removed. The foam seemed to keep the ‘memory’ print of your hand for several minutes. Just because NASA forgot about their invention doesn’t mean that memory foam went unnoticed. A Swedish company that was closely associated with NASA picked up memory foam and ran with it. This company kept experimenting with the foam until ten years later they developed a material that would not break down over time. This foam contained gel-like plastic that also seemed spongy. The open-cell structure of this material allowed the foam to deflate under pressure then redistribute the air bubbles to neighboring cells. Finally, memory foam had a useful purpose. Tempur-Pedic was the first company to start marketing the new memory foam. At first, only hospitals and other health care facilities could afford the expensive mattresses. Patients reported a significant decrease in pressure points and increase in back support. It wasn’t until the 1990s that memory foam mattresses became affordable to the general public. At first, memory foam mattresses were extremely expensive. It wasn’t until other companies began to sell the memory foam mattress that the price came down. Memory foam is most often used in mattress toppers, pillows and mattresses. However, memory foam continues to prove to be a very versatile material. Memory foam is also found in positional sleep aids, office furniture, vehicle seat padding, footwear, pet beds, car seats, infant cribs, hip pads, wheel chair cushions, computer carrying cases, pistol gloves, padded sweatpants, tennis racquet handles and even ear plugs. The longer memory foam is on the market, the more products we will see using it. 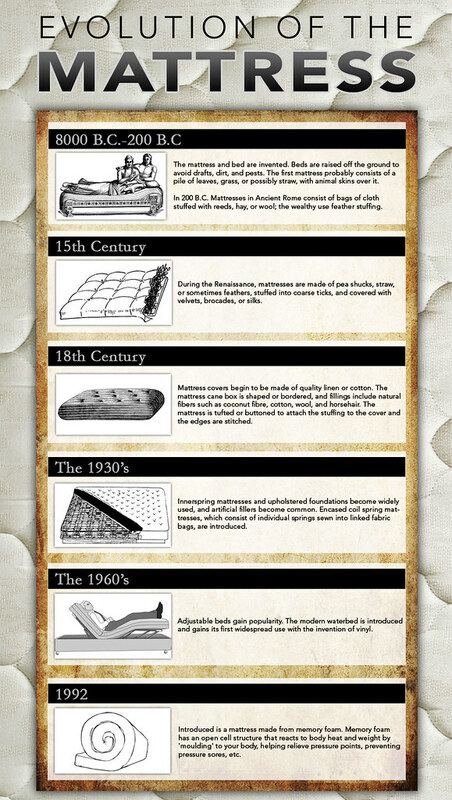 We shared this graphic late last year about the history of the mattress, but wanted to share it again here because we feel its appropriate. Need A Mattress For Your Chris Craft Boat? Got the mattress yesterday. Opened it up and let it relax, and tried it out. Looks like it will suit our needs just great. Thanks, again, for the timely response to our questions, and for the prompt and efficient way in which you filled our order. I will be recommending Rocky Mountain Mattress to the Chris Craft company for any other customers that need a similar type replacement for their v-berth.